Green Lantern #0 exemplifies the kind of comic I'd hoped to see more of with The New 52. Too many of the titles DC Comics introduced and reintroduced in the last year have done little more than rehash that which has been done before and done to death. Even Geoff Johns, whose work I generally enjoy has been guilty of this to a degree. His Green Lantern title did present us with the novel oddity of Sinestro being forced to wield a Green Lantern ring but the actual story, like Blackest Night and Brightest Day before it, featured Hal Jordan and Sinestro being forced to work together to face a mutual enemy. It was enjoyable but there was little sense that we were truly seeing something new. And whatever else may be said about Green Lantern #0, it presents something new. 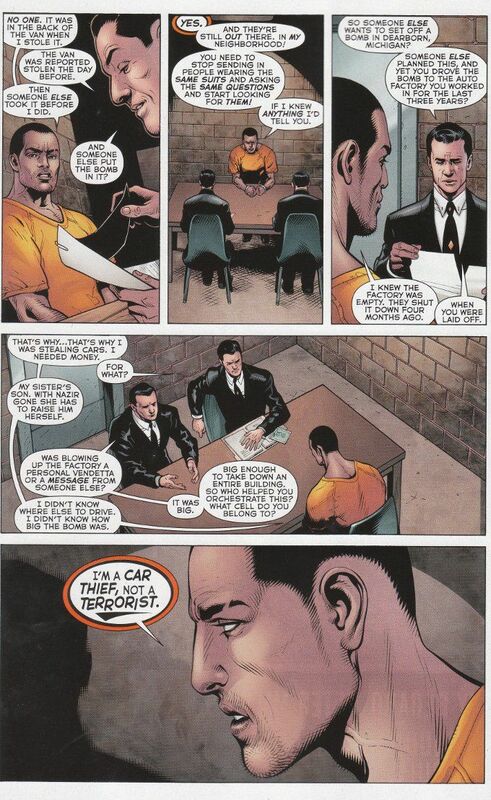 The action of the issue centers upon Simon Baz - an Arab-American who lives in Detroit, Michigan. A recently laid-off auto-worker, Simon has turned to car theft to make ends meet. Despite this, Simon is portrayed as a sympathetic figure and even a heroic one. His thefts are implied to be taking care of his family and when he discovers that his most recent catch has a bomb in it, he risks his life to try and dispose of it in a way that will ensure nobody else gets hurt. Still, no good deed goes unpnished and Simon's spur-of-the-moment plan leads to his arrest. The fact that the abandoned building he chose to drive the bomb into was his former place of employment coupled with the sheer unlikelihood of him stealing a vehicle that already had a bomb in it makes things look very bad for Simon. Throw in the fact that he's a Muslim and an Arab and the narrative is already written in the minds of the police and the feds. Luckily, fate has other things in mind for Simon Baz and salvation arrives in a sudden flash of green light. This is one of the best scripts we've seen from Geoff Johns in quiet some time. We can tell that Johns - himself an Arab-American from Detroit - drew off of his own personal experiences into the scenes depicting Simon's early life and it makes Simon seem all the stronger as a character for that development. This issue reminds me of Johns' earlier work on JSA, where he frequently introduced new characters with similar panache. Doug Mahnke continues to impress with his pencils. We see none of the Green Lantern standards with this issue - no big-headed alien beasties or elaborate constructs of solid light. Still, the action of Johns' script is well depicted and Mahnke is one of the best visual storytellers in the business, adding intensity even to the panels depicting people sitting down and talking. If you haven't been reading Green Lantern before, now is the prefect time to start!